Despite the number of food choices at Angel Stadium [my regular haunting grounds as a baseball fan] - whenever I go to a game, I usually don't buy anything to eat inside the stadium, preferring to walk to get something to eat at a McDonald's, Carl's Jr. or a Mexican place near the stadium. During last Saturday's game against the Baltimore Orioles, the hot dog stand in the courtyard where the Gene Autry statue is located [on the Field Level] called out to me - I really didn't want to go out and walk across the street to likely go to Carl's Jr. again. I think I had enough money and was either going to get the 'specialty' nachos [don't remember what they were called] or a random hot dog - topped with different things, each hot dog sold is supposed to represent a different MLB ballpark. I scrounged enough change and bought a 'Halo Dog,' for $7.50 - which featured a bacon wrapped hot dog topped with jack cheese, charro beans and chili pepper relish. I lugged my hot dog [and a bottle of water I found along the way] all the way out to the picnic tables out behind centerfield - the bun had gotten a little soggy and I had to eat the hot dog with a fork and pick at the toppings, instead of eating the hot dog with my bare hands. The relish was sweet, tangy and spicy while the bacon added some more flavor / saltiness to the already sodium laden hot dog - I don't know if the hot dog hit the spot, but I wouldn't mind missing a Carls Jr. meal for this, even there was really no drink to go with the hot dog. If I get the hot dog the next time, I might save time, energy and maybe a buck - during the game I saw the hot dogs were $6.50 by the concession stands on the Terrace Level concourse in left field. I took a picture of the menu to remember what the name of the hot dog was and what the toppings were - it was similar to ones sold at the courtyard on the Field Level. 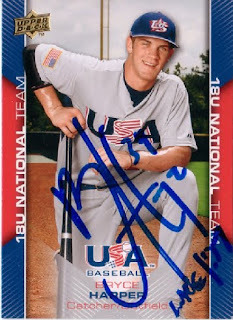 With the Angels' high profile draft pick Kaleb Cowart signed up, it maybe time to look back at another high school bonus baby the Angels signed back in 2004 - Mark Trumbo was touted like Cowart was, a potential future star in the Angels' system. While Trumbo has steadily climbed the minor league ranks, he is currently a 24-year old who may or may not get a cup of coffee with the Angels in 2010 - it might not be inconceivable to think Cowart may spend as much as five years in the minors and still not get to the Major Leagues. I picked up his first certified autograph four years ago - while not letter-for-letter, the autograph is more legible on the certified autograph card from 2004, compared to the in-person autograph I got in-person this past year in spring training. Cal Ripken Jr. memorabilia display scam? I found this scan of a Cal Ripken Jr. framed memorabilia display and while I assumed the scraps of jersey / ball / base material were otherwise 'game used' in a Major League game - the 'Authentic Ball' material features the logo of an official league baseball instead of an official Major League Baseball. I think these displays [more like cheap cardboard mattes with a random trading card affixed along with the 'memorabilia' pieces] are sold with repacks at various retail stores for about $10 - maybe in a couple of various baseball card / sports card forum threads, I've read various discussions about the authenticity of the scraps of jersey / ball / base material. 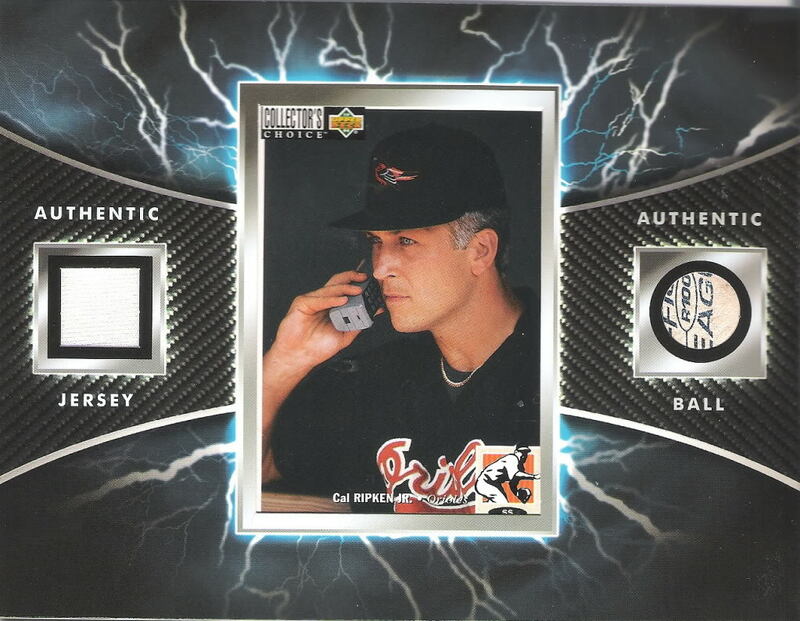 Seeing the Cal Ripken Jr. display makes me chuckle a little bit - something is clearly fishy with these things. Led by Jose Bautista, who has hit nearly 40 home runs in what has clearly been a career year - the Toronto Blue Jays have bashed and smashed their way into a respectable baseball club, despite being obscured in the American League East. 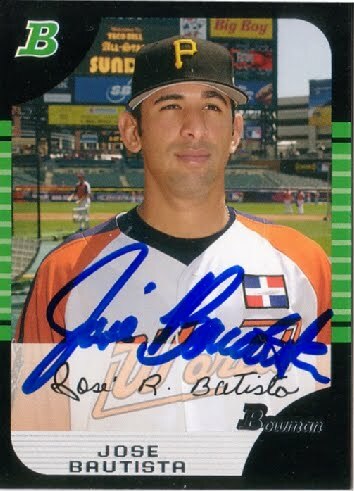 Coming into the 2010 season, Bautista had bounced around as an 'every day' utility player who reminded me of this guy - now Bautista probably will get an opportunity to secure a pretty good contract for himself. All I can say is when a guy is enjoying a breakthrough season or surpassing what he has done before - it is kind of exciting jumping on the bandwagon, particularly when a particular guy is hitting home runs all over the place. Bryce Harper, most hyped up amateur ballplayer since Stephen Strasburg has been finally inked up to play ball professionally by Strasburg's Washington Nationals - even though there is a lag time as far as the impact a player [even the No. 1 overall pick like Harper] can make in pro baseball, Harper is supposed to bust through that reality and get to the Major Leagues much sooner than later. Let's just all hope any growing pains and any possible immaturity issues coming from an 18-year old kid who is suddenly rich, rich, rich doesn't cause him to go Josh Hamilton on us - getting random tattoos and 'losing himself' for five or six years before he is mostly on track again. As the next great hope, the least Harper could do is stay clean cut and be in position to fulfill his immense promise as a baseball immortal. I got this card among a small group of Kansas City Royals players' cards given to me by a friend's friend who was visiting from Japan - it is a 2003 Topps 205 mini of Bryan Bullington, the No. 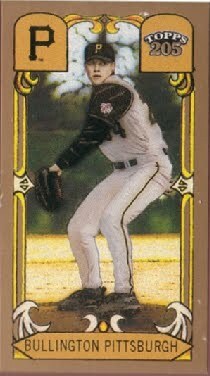 1 overall pick in the 2002 draft by the Pittsburgh Pirates. Bullington has spent just a little bit of time in the Major Leagues with four different teams in five years - he recorded his first Major League win for Kansas City on Aug. 15 against the New York Yankees. Bullington shut down the Bronx Bombers for eight innings, allowing only two hits and striking out five - at this point who really knows if he can make stick around the Major Leagues. Still, in the realm of professional sports - it is nice to watch an athlete who has battled some adversity enjoy any sliver of success. It is probably no coincidence I'm throwing this up at a time where at least a couple of collectors - have expressed concerns about their own collecting endeavors. For me personally, I love the novelty of collecting baseball cards - partly because I can objectify the players I may get to see on TV and in-person through little pieces of cardboard that are supposed to be collectible in one form or the other. However there are so many random cards scattered about in a bed I'm probably supposed to have been sleeping in, my computer table, my sorting table, out in boxes all over the floor in my room, et al - I've kind of let the cards pile up without dilligently picking after myself. IT IS LIBERATING TO SEE HOW pointless collecting baseball cards is -when I can't account for particular ones or when I feel like I'm buried under the rubble. Do I really to pick up anything else? I don't really have the gumption to consume anymore new cards. During the last 10-15 years, I don't know if I've been able to buy as many cards compared to the average Collector Joe who spends hundreds or thousands of dollars each year - but I feel a big burden with the amount of card clutter I refuse to have anything to do with at this time. Do I have a collecting goal and/or purpose - yes, it just doesn't have anything to do with baseball cards right now. I'm more interested in collecting baseball autographs in-person - other than picking up ones picturing players I hope to see in-person and trying to get them inked up. Living within a half hour to a Major League Baseball stadium, collecting baseball autographs in-person - keeps me compelled to keep up with baseball cards, but I've taken one, long detour as far as having a beat on what actual baseball card collectors / speculators are going gaga about these days or not. After being traded to the Kansas City Royals for infielder Alberto Callaspo - here is hoping Sean O'Sullivan develops into a dependable starting pitcher. The tubby righthander seemed to be a decent pitching prospect in the Angels' system - he could be one of those guys who pitches around 200 innings for three or four seasons in his prime, before his career winds down at the Major League level. I read a feature story on O'Sullivan in a San Diego newspaper around the time when he was first called up in 2009 - I clipped the article about O'Sullivan's journey to the Major Leagues and eventually had him sign it this past year during spring training.